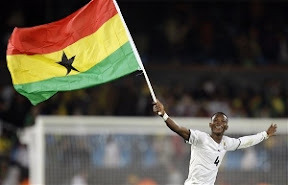 Asamoah Gyan scored on an 84th-minute penalty kick Sunday as Ghana beat Serbia 1-0 in a Group D match at the World Cup. Zdravko Kuzmanovic needlessly handled a cross in the area, then argued the call and yellow card he received. Gyan drove the penalty kick high to the left for the only goal at Loftus Versfeld stadium. Germany plays Australia in the other group game later Sunday. The only African team to reach the second round at the 2006 World Cup, Ghana had the vast majority of the support among the South Africans in the stadium. Gyan almost made it 2-0 in injury time but hit the post after a burst down the left side.